Because of their flexibility and accessibility, credit cards can impact your credit score more than any other kind of account. The following five tips can help you cultivate the kind of score that can lead to better interest rates, lower insurance premiums, and even faster job offers. As many of us discover, a pre-approved credit card application in your mailbox doesn't guarantee you a new account, especially if you recently moved. Department store charge cards and bank credit cards opened up in person often mark the first step in your journey toward a strong FICO Score. Lenders willing to meet with you in person and to review your driver's license and other identity documents kick start your credit profile. Having established your identity and current address with the credit bureaus, you can earn enough points to get approved through automated systems. Nearly a third of your total credit score reflects the amount you currently owe on your collective debts. The latest versions of the FICO Score and other credit ranking systems assign lower risk values to lenders who consistently keep their open balances at about 50 percent of available credit. Having too much credit available signals a high risk that you might run up balances in the event of an illness or an employment change. Maxing out your cards not only reduces your credit score, it makes traditional lenders nervous while attracting offers from companies that like to make profits from over limit fees and high-risk credit rates. Closing an account can make your available credit appear to dwindle, so be careful when canceling your cards. 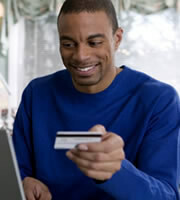 Lenders extend the very best credit card offers to borrowers who manage multiple accounts effectively. That means maintaining a balance and keeping track of the fine print on any promotional offers. Because closing an active account could negatively impact your FICO Score, experts recommend cycling active credit cards through your wallet. When you make at least two charges every six months on each card, lenders typically issue positive and accurate information to credit bureaus. Most credit score models reward customers who make regular, monthly payments. Thanks to expanded reporting guidelines, that means a missed rent or utility payment can hurt your FICO Score as much as missing the deadline on your credit card bill. Because as much as 35 percent of your credit score reflects your ongoing payment history, it's essential to do everything possible to get minimum payments to credit card companies on time. Balance transfers, online payments, and special accommodations can keep this metric from dragging down your overall credit rating. Recent revisions to credit bureau scoring profiles indicate that the number of new accounts in your credit report can affect 10 percent of your final credit score. Therefore, it helps to accept an occasional balance transfer offer or to opt for in-store financing on large purchases. If your new lender requires you to cancel another credit card, choosing an account from the mid-range of your credit history can keep you from inadvertently damaging your FICO Score. Contrary to late night television ads, nobody can change your FICO score overnight. Reviewing free annual credit reports and paying for credit scoring services can give you insight into the steps you may need to take to make yourself more attractive to lenders. For instance, opening a secured credit card account can help repair your credit, as long as you make minimum payments on time and keep your credit utilization at about half of your overall availability. Nurturing your oldest accounts back to health can also offer a major boost to your score, especially if you missed payments or overextended your credit. By keeping all five credit scoring factors in mind, you can make the right decisions for your financial future. 0 Responses to "How Credit Cards Improve Your Credit"